I use both interchangeably in my dual boot laptop, most of my work related files is kept in a shared partition, this way I can use either Ubuntu or Windows any time. I could use a virtual machine hosting Windows or Ubuntu but I don't like the idea of allocating a good chunk of resources to run a Virtual machine in my "not a high end" laptop. Package Management tools - Synaptic, aptitude and apt-get make software install a cinch. Lack of ITunes port for Linux. Yes there is Rhythmbox, but it does not for some reason synch my iPod Nano. Picasa - I know a port using Wine is available, but I would have preferred a native version. Flash experience is buggy - It works but there are bugs - for eg, I have issues in watching videos in full screen mode at TED, if I go into a fullscreen mode there are times when I hear the sound but no window. 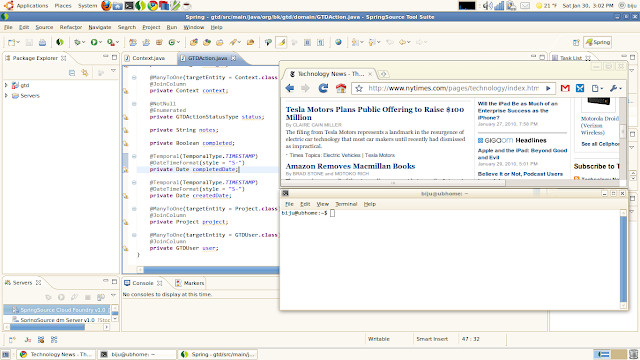 Java applications like Netbeans, JEdit with default look and feel(typically Metal) look very bad in Ubuntu, if the L&F is changed to GTK then it is passable. Hibernate and Resume is very slow(order of minutes) in Ubuntu. Office suite - some of my work related documents does not open up correctly using Open office, and there is no equivalent of Visio in Open office.